Come out to Camp Fontanelle and enjoy the activities during its Second Season, September 16th -November 4th. 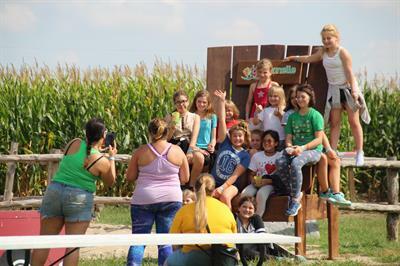 The Pumpkin Patch and Corn Maze at Camp Fontanelle has been around since 2007 providing family fun at a reasonable price. Your entrance fee allows you unlimited access to the following: 9-acre corn maze, 2 large Jumping Pillows, a Petting Barn with exotic and domestic animals, yard games, Bounce House, Hay Rack rides, Fort Jones, Roller Slide, Human Foosball, Mine Shaft (Vertigo Tunnel) and Mole Ball. In addition, for the young, there is the Barrel Train, Trikes for Tykes and the Cave of Trickery. For an additional fee you can ride the zipline, which is two 350? rides for $10.00, play laser tag in the maze, 10-minute game for $3.00 and new this year, tree climbing, 40 minutes for $10.00. A full concessions stand is also available if you find yourself hungry. Pumpkins can be purchased with a freewill offering. All profits from the Corn maze and pumpkin patch go back into the programming at Camp Fontanelle. This programming includes summer resident camp, Christmas Camp (a camp for kids in need of a blessing,) Easter Family Fun Day and Movie Nights. It also supports the Search for Treats in the Maze which is held at no additional cost to the guests on October 21st and October 28th. 9677 County Road 3, Fontanelle, NE. Camp Fontanelle is located in Washington County, 2 miles south of the community of Fontanelle off of Highway 91. Head south on 8th Street in Fontanelle (which turns into County Road 3) and follow the road until you see the Camp Fontanelle sign on the west side of County Road 3. It's just a 15 minute drive from Fremont. 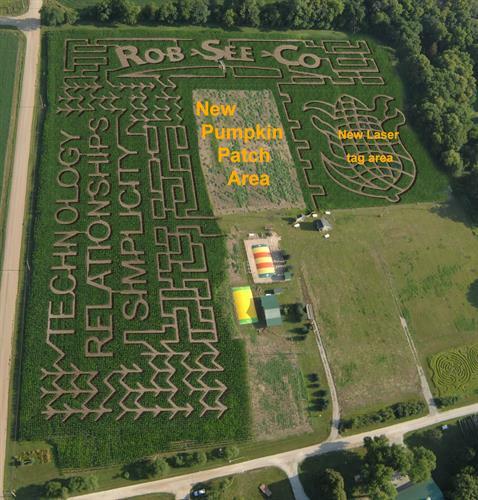 The Corn Maze and Pumpkin Patch opens on Sunday, September 16 at 1:00pm. It is open through Sunday, November 4th at 7:00 p.m.